DIE Martis, 18 die Decembris. Epus. Carlile. Ds. Cancellarius Angl. The Earl of Bridgwater reported, "That the Committee have considered of the Bill for uniting Churches in the Town of South'ton; and think it fit to pass, with some Amendments." Which, being read Twice, were Agreed to; and the Bill ordered to be engrossed, with those Amendments. Hodie 1a vice lecta est Billa, "An additional Act for enabling a Sale of Lands to pay the Lord Strangford's Debts." Next, the House took into Consideration the Evidence of the Witnesses of Robert Roberts and Sarah his Wife, and the Evidence of the Witnesses of Griffith Wynne, alias Bodvell, and Thomas Bodvell, Infants, and Thomas Wynne, delivered at this Bar, concerning the Matters contained in the Bill for settling the Estate of John Bodvell Esquire, deceased. Then the House was adjourned into a Committee, to take into Consideration the Bill for raising Money by a Poll. The Lord Privy Seal reported to the House, "That the Committee, in reading the Bill for raising of Money by a Poll, find that the Peers have particular Sums set upon them in the said Bill, which their Lordships conceive is an Invasion of the Peers; therefore think fit that their Lordships do consider of some Way to require Reparations for this Breach of Privilege." Whereupon it is ORDERED, That this House resume the Consideration of this Business To-morrow Morning; against which Time the Committee of Privileges do meet, and peruse what hath been done in the former Poll Bills, and the Proceedings thereupon, and report the same to this House. 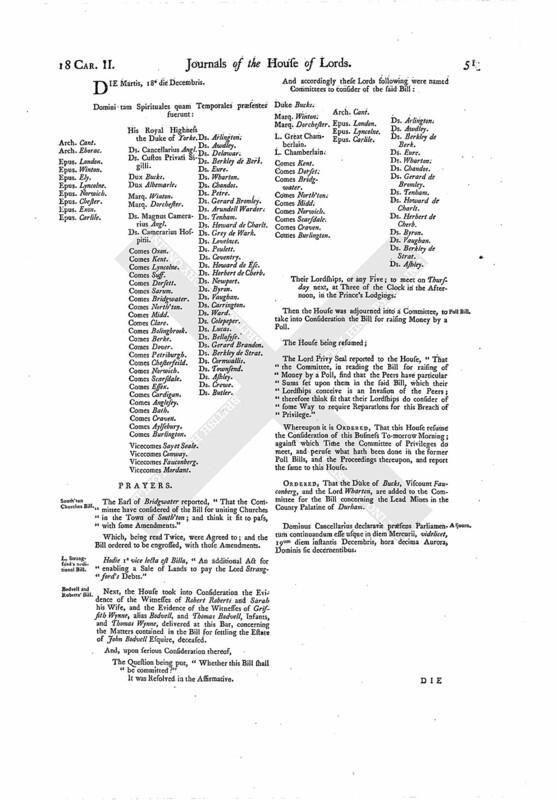 ORDERED, That the Duke of Bucks, Viscount Fauconberg, and the Lord Wharton, are added to the Committee for the Bill concerning the Lead Mines in the County Palatine of Durham. Dominus Cancellarius declaravit præsens Parliamentum continuandum esse usque in diem Mercurii, videlicet, 19um diem instantis Decembris, hora decima Aurora, Dominis sic decernentibus.